William Embry Wrather graduated in 1908 from the Department of Geology at the University of Chicago. Shortly thereafter, he was employed by the J. M. Guffey Petroleum Co., predecessor of Gulf Oil Corporation, in Beaumont, Texas. Realizing that petroleum geology was rapidly gaining acceptance in the oil industry, he eventually resigned his position and opened an office as consulting petroleum geologist at Dallas, Texas. When the United States became involved in World War II, he entered Government service in Washington. For about a year, he was connected with the Board of Economic Warfare, engaged in procurement of strategic and critical minerals and metals from foreign sources. In 1943 he was appointed by President Roosevelt Director of the U. S. Geological Survey. Dr. Wrather participated actively in professional societies which were related to his work. 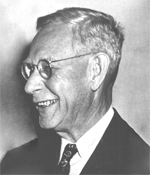 He was a founder member of the American Association of Petroleum Geologists and aided in the formulation of its standards and policies, serving as its President in 1921. He was President of the Society of Economic Geologists in 1934 and of AIME in 1948. He is a Life Trustee of the National Geographic Society. He has been awarded many honorary degrees.